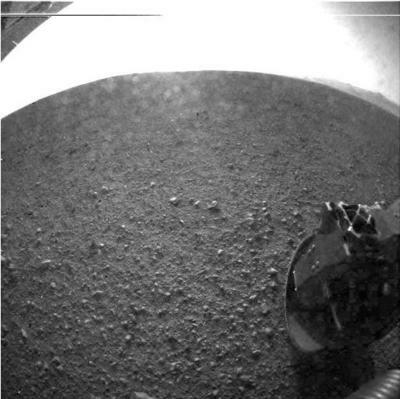 After more than eight months, and a journey of 352 million miles, Curiosity has landed on Mars. In the early morning hours of August 6 Eastern Time, the Mars Curiosity Rover successfully landed on the surface of Mars in one of the most complex maneuvers in the history of the space program. As we described to you yesterday, the rover went through multiple stages to set its wheels on the Martian soil, including the odd final stage of being lowered 21 feet on tethers. 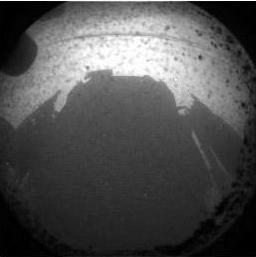 Shortly after the landing, Curiosity snapped an image with one of its hazard cams that showed its shadow, confirming that it had landed on solid ground and was upright. This was followed by the image you see above with its black and white fish eye lens to show the horizon. Visible in the image is one of the wheels, showing that those appear to have deployed correctly. With the wild jubilation in the control room completed, now comes weeks of system checks to make sure all of the scientific equipment survived the arduous journey and landing. Once all of the tests are done, Curiosity will then be able to get down to the business of testing soil, drilling core samples and more. The first color high definition panoramic images are not due until later this week, but if the camera has survived the journey, we should receive some stunning images. The mission is managed by JPL for NASA’s Science Mission Directorate in Washington. The rover was designed, developed and assembled at JPL. JPL is a division of the California Institute of Technology in Pasadena.